Flexible and transparent heaters have gradually attracted considerable attention because of its widely application in defrosting or demisting windows and medical thermotherapy. The stability of the heater under ambient conditions during working is one of the important properties. 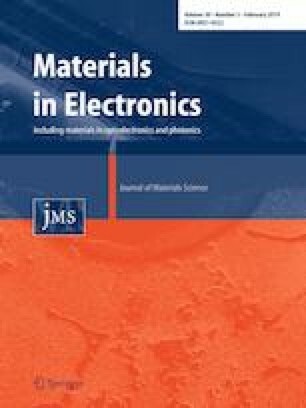 In this paper, we fabricated a highly stable and transparent film heater (TFH) through a simple drop-coating approach with burying silver nanowires (AgNWs) between colorless polyimide (cPI) and polymethyl methacrylate (PMMA). The developed TFH exhibited higher stability with the resistance increasing by 17% only for the initial value of 9.6 Ω after accelerating test at 105 °C and 100% relative humidity for 36 h, which was much lower than that of 83% for TFH without PMMA. Furthermore, the fabricated film heater covered with PMMA showed extreme stability in hydrogen sulfide oven. Meanwhile, there was no significant influence in the transmittance, mechanical flexibility and heating performance after coating a PMMA layer. Finally, we applied the film heater to demisting demonstration. The online version of this article ( https://doi.org/10.1007/s10854-018-0480-4) contains supplementary material, which is available to authorized users. This work was supported by the Program for the Ningbo Municipal Science and Technology Innovative Research Team (No. 2016B10005). Supports were also provided by National Natural Science Foundation of China (Nos. 61774160 and 61605224) and Ningbo Natural Science Foundation (Nos. 2017A610026 and 2017A610021).